The Sipping Jetstreams Surf DVD Video is presented as a romantic surf novel. It is supposed to take you to some of the most beautiful surfing destinations, featuring some of world’s best surfers. If you enjoy surfing, this DVD is something you will enjoy. It will take you to Italy, Egypt, the Caribbean, Greece, Japan and Cuba and not only shows you these destinations and how to surf there, but also enable you to get to know the surfers and their personalities. The Sipping Jetstreams DVD is set to be the best surf DVD ever to be released and it is available from Amazon at a reasonable price. Some of the world’s best surfers, including Bruce Irons, Shane Dorian, Kelly Slater, Benji Weatherly, Andy Irons, Rizal Tangjung and Dane Reynolds, to name but a few. Many people have eagerly awaited the arrival of this DVD, and for good reason. It is a very typical movie that you will either love or hate. There is not much commentary, dialogue or narration, being in essence more of a photographic documentary with some fantastic musical background tracks. It effectively describes the relationship between the surfer and nature. There are great elements of humour in the Sipping Jetstreams DVD and it really shows not just the beauty of nature, but also how we connect to it as surfers. If you do feel you need narration as well, the bonus features such as the behind the scenes and the director’s commentary contain this. On the down side, people have mentioned that there are too many wind swell surf scenes and that it is quite expensive for what it is. Whether or not you find it too expensive is a matter of personal choice, it is no more or less expensive than any other DVD on Amazon. The Sipping Jetstreams Surf DVD Video is said to be the best surf DVD ever made. Whether it is or not really depends on personal preferences. Marketed as a surfing novel, it really is more of a photographic documentary. However, the shots are absolutely fantastic and it really does demonstrate the relationship surfers have with nature, trying to live side by side rather than trying to overpower nature. 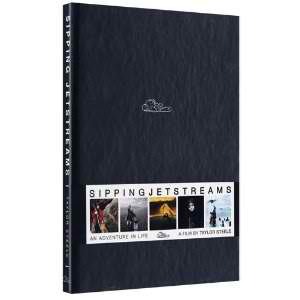 Whether you are looking for a DVD because you simply enjoy watching surfing, or whether you are looking for some great tips on where to surf and how to surf, the Sipping Jetstreams DVD is a fantastic addition to any collection. It would also make a great gift for any surfing enthusiast, particularly since it is reasonably priced on Amazon ($34.95 to buy or $7.99 on instant video). The design of the box is incredibly sleek, meaning that you won’t even have to wrap it up and it will look great on anyone’s shelf at home. This entry was posted in DVDs, Reviews, Surfing and tagged DVD, Sipping Jetstreams, Surfing. Bookmark the permalink.